Today we filled our pinata with delicious candy. We can’t wait for our summer party! Today we painted out pinata. We can’t wait to play with them at our summer party! We planted cherry tomatos in May, and now they are ready to eat! YUMMY!! Another hot day, another trip to the pool! 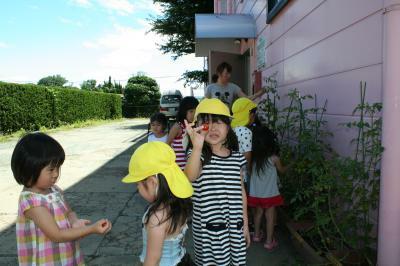 Today we had a birthday party for our students who were born in July. 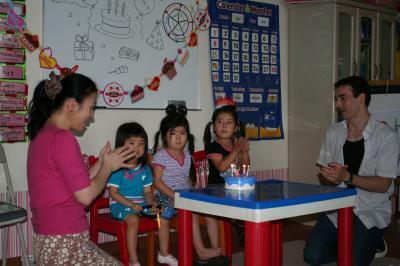 We sang songs, saw our birthday children’s baby’s pictures, and played games. We made kinako dango too. They were yummy! Today we drew and colored pictures of a house with clouds in the sky. We glued pieces of cotton on our pictures for clouds.We hope our parents will like them! Today we practiced pinata striking and safety. Today we talked about the things we can do in various seasons. Afterwards, we played a circle game to help us understand and remember the seasons. Today for show and tell we talked about our Tanabata wishes. 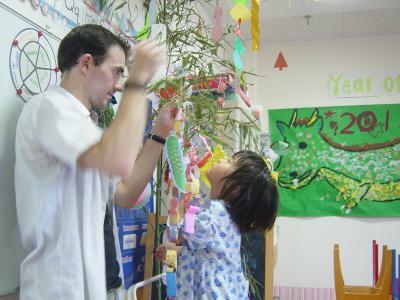 Afterwards we decorated our Tanabata tree! We had rain for the past few days so we couldn’t play in the water. Today was fine and hot so today we could! We love playing in our pool! This month’s themes are the weather and seasons. We are learning nice songs that talk about the weather. These songs are ”You Are My Sunshine.””Rain, Rain Go Away,” “I Hear Thunder,” and “Twinkle, Twinkle Little Star.”We love singing about the weather! Tanabata is here! 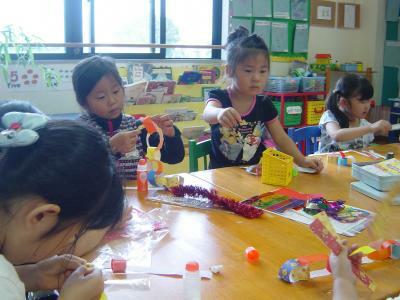 Today one of our grandpas gave us a nice bamboo branch to decorate and we spent some time making decorations. 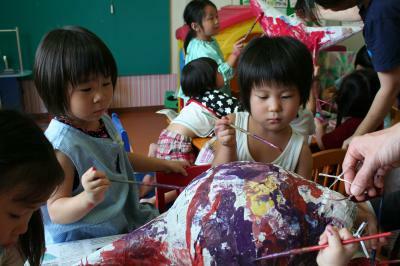 We love Tanabata!